Workers at a Fiat Chrysler plant in Warren, Michigan. The UAW is seeking new contracts for 140,000 U.S. autoworkers. The labor contracts for 140,000 autoworkers expires at midnight, and negotiators for the United Auto Workers and Fiat Chrysler are back at the negotiating table on Monday. A deal could determine the competitiveness of the U.S. auto industry over the next four years. The talks come at a time when the three big American car makers -- Fiat Chrysler, General Motors and Ford Motor -- are enjoying near-record sales and a return to profitability. The industry employs nearly 25% more hourly workers than it did when the last contract was negotiated in 2011. A big issue in the talks is a two-tier classification of workers that was put in place nearly a decade ago when the industry was on the verge of collapse. 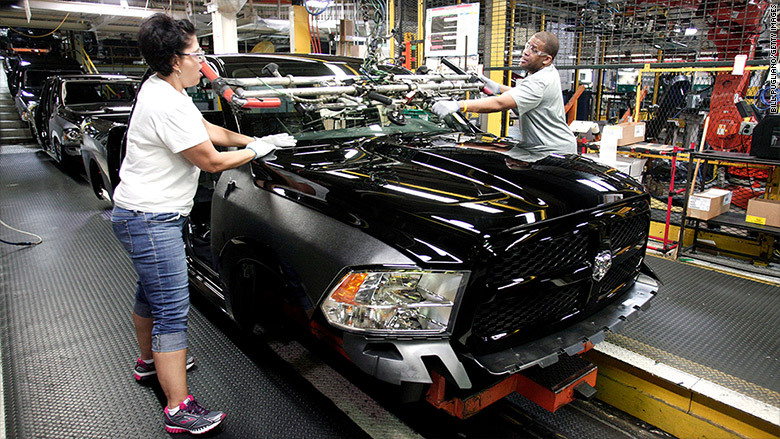 Veteran auto workers earn about $28 an hour, which hasn't changed in 10 years. They want a raise. But the union also wants a bigger percentage raise for workers hired since 2007 who earn a maximum of $19.28 an hour. The union wants to narrow or eliminate the gap between the two groups. The UAW surprised observers Sunday by selecting Fiat Chrysler, (FCAM) the financially weakest of the three U.S. automakers, to be its "target" automaker. The target is the company the union tries to reach a deal with first. But typically, the UAW picks the strongest automaker to be the target. The decision basically put talks with General Motors and Ford Motor on hold. The union will likely seek to match whatever it wins from Fiat Chrysler in subsequent deals with GM (GM) and Ford (F). The contracts at all three automakers expire at 12:01 a.m. ET Tuesday. The GM and Ford contracts will now be extended while negotiators focus on Fiat Chrysler. An extension is also possible there, but there is also a risk of a strike if no deal is reached by midnight. Experts say if a strike happens it likely will be a very short, "micro-strike" similar to brief strikes at GM and Chrysler in 2007. The Chrysler strike that year lasted less seven hours. The UAW has been trying to organize nonunion U.S. plants operated by foreign automakers such as Toyota, Honda and Volkswagen. It doesn't want to scare nonunion workers, who may fear that they will have to go on strike if they join the union. The union narrowly lost an organizing vote at the VW plant in Chattanooga, Tennessee, last year. "I don't think [UAW President] Dennis Williams really wants to strike," said Art Schwartz, a former negotiator for GM and now a labor contract consultant. "A long strike will provide a lot of ammunition to the people who defeated the UAW in Chattanooga."